Capturing a family’s journey through parenthood has got to be one of the biggest joys with my photography. I had the privilege of documenting this husband and wife’s journey with a maternity session, Fresh 48 hospital newborn session, and an in-home newborn session. Desiree had a vision for her maternity session and I knew the perfect location right away. I went hiking with my family the summer before and while we were headed to a new hiking spot I drove past the big open field and an amazing shallow river flowing through it. I just had to pull my car over and check it out. The tall mountains filter out some of the harsh sunlight and allows the river to remain in perfect lighting throughout most of the day. Ever since that day, this has become a favorite photo location of mine and also a fun spot to visit with my kids on a hot summer day. The heat was no joke during their maternity session and getting into the water sure was refreshing. Any other parents remember the days of diaper changing jitters? Those first few diaper changes with your newborn are stressful, don’t lie! They are so small, kicking their little legs all over the place, most likely crying because they are cold and just want to be snuggled. You’re trying to move fast but want to be gentle. Is the diaper too tight? Not tight enough? Is this going to explode in a matter of minutes? Flash forward to 6 months and you are a one handed diaper changing pro. Second children? Pfft you got this! There is nothing else like walking through the door of your home with your brand new baby for the very first time. You suddenly see everything differently. You quickly learn to navigate your rooms in the dark as you’re waking up for feedings and diaper changes. You start to realize just how loud your dishwasher really is after you JUST got your little one to sleep. But man, do you also start noticing how your couch is the perfect afternoon snooze spot, and how perfect your living room carpet is for tummy time. Bringing your new baby home changes everything in an instant and each day is filled with a new adventure. 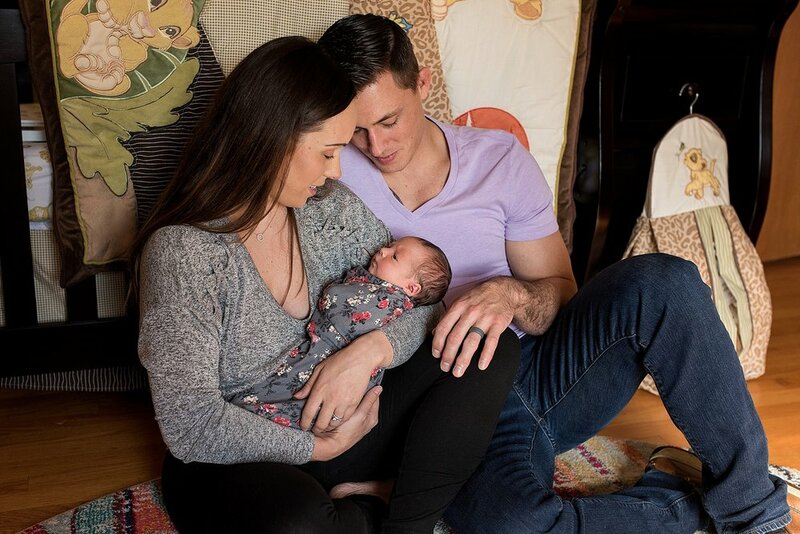 Connecticut Newborn Photographer serving all of CT including Middlesex County, Fairfield County, New London County, Tolland County, Hartford County. Specializing in lifestyle newborn photography. Capturing simple and natural baby photography. Maternity and newborn photography packages are available.